Looking for the perfect free standing hammock for your backyard, patio, or cottage? We’ve sorted through the hundreds of options and have come up with the 15 best free standing hammocks to share with our readers. 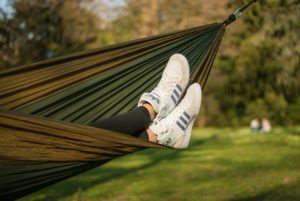 Whether you’re looking for a 2 person hammock, a hammock swing, or a camping hammock, I’ll help you pick out the perfect one to suit your specific needs and desires. Before you purchase just any free standing hammock though, it’d be worth it to cover a few basic points so that you can know you’ll be happy with your choice. When doing product research for this guide, I discovered that many of the people who were not fully happy with their purchases were describing issues easily avoidable had they known what to look for initially. Hammock Styles: Which style suits you best? There are different types of hammocks, and people do generally prefer one type over another. 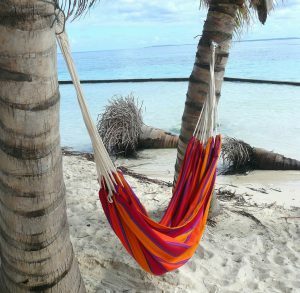 Spreader Bar style hammocks: Some people do not like the feeling of being cocooned inside a hammock – they prefer to lay across a fairly taught hammock bed. These hammocks have two (usually wooden) spreader bars, one at either end of the hammock material, keeping the ends spread apart. These hammock beds can be made of a thicker or even sort of quilted material than the Brazilian style, and sometimes even come with detachable pillows. See #2 below for our top rated Spreader Bar style hammock. Brazilian style hammocks: These are the hammocks that make you feel cocooned inside the material. There is no bar along the ends of the hammock bed – just ropes that meet where it attaches to the stand. The Brazilian style hammock design causes the material to gather and when you get into the hammock, you can end up tucked inside, hidden away from the world, swaying away cozily in a rather private feeling “cocoon”. See #1 below for our top rated Brazilian style hammock. 4 point hammock: These hammocks are attached by 4 points – as opposed to 2 roped together ends. At the head and at the foot of the hanging “bed”, the material is attached to the frame by 2 dowels and chains. These are not overly common hammocks, as most people picture true hammocks as being “beds” hung from 2 points. See #7 below for our top-rated 4 point Hammock. Hammock Chair: A free standing hammock chair is hung from a solitary point above the chair. The frame generally has a tripod shape of sorts that allows for a considerable amount of weight to be hung safely and comfortably from the top of the frame. The chairs can be made from different materials, and come in Brazilian style (loose material that you climb into, so to speak) or be more form fitted. See below for our 3 top-rated options. 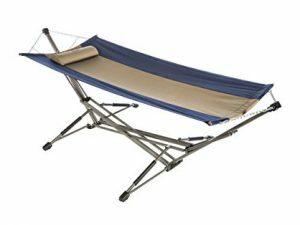 Camping Hammocks: These are lightweight, extremely portable hammock beds, designed for frequent assembly and disassembly. See below for our top rated options. 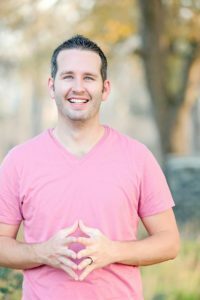 Size: What size will work best for my needs? How much space do you have to work with? It would be rather frustrating to purchase and assemble a hammock you’ve been admiring, and then realise after the fact that it takes up way too much of your patio, doesn’t fit on your balcony, or isn’t long enough for your needs. Most Brazilian style hammocks have a shorter frame, coming in around 9 feet (108 inches) long. Spreader bar hammocks are usually somewhere around 12-15 feet (144-180 inches) long – a significant difference. Width-wise, the majority of hammocks come somewhere between 3 1/2 and 6 feet (42-72 inches) across. Spreader bar hammocks generally are wider than Brazilian, although the distance required around them for safe swaying can be similar. Whatever style you are eyeing, make sure you read product specs and do measure your floor space to ensure it’ll fit. Materials: What feel do I want to have? Cotton: Usually 100%, tight weave. Cotton gives you a soft feel, allows air movement, is a natural product and can be washed. Do not put cotton hammocks in any sort of dryer, however, as they will shrink! Cotton is considered the most luxurious feel for hammocks, but it is not the most durable of the 3 main fabrics. Polyester: Polyester is more durable fabric than cotton, more mildew-resistant and mold-resistant than cotton. It’s soft, not slippery – can feel somewhat like a soft canvas. Often the “quilted” hammock pads are made of polyester or polyester/cotton blends. 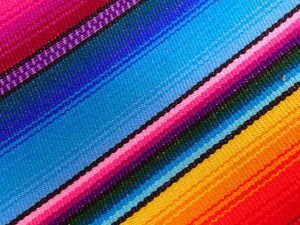 Polyester fabrics also boast higher fade-resistance than cotton- good to consider for hammocks that will hang in a sunny location. Sunbrella: Sunbrella is a newer man-made fabric composition, soft like cotton, yet extremely weather-resistant. Sunbrella is very durable, super stain-resistant, and also resists rot, mildew, chlorine and atmospheric chemicals. Sunbrella is the most expensive of the fabric options, but it’s your best bet if you want your hammock to last for years to come. Portability: Will you be wanting to move it regularly? Are you hoping to bring your fabulous hammock with you camping, to the cottage, or elsewhere? Or will it stay put in your backyard, maybe just being slid into the shade or sun as desired? Several free standing hammock options we highlight here come with a sturdy portable carrying case, and are designed for easy assembly/disassembly. These are relatively light weight (just over 30lbs), and require no tools to set up or take down (the steel poles snap together). Other hammocks are much heavier, and the frames require bolts and some assembly work – to put it mildly, you wouldn’t be too interested in taking them apart all that often. Accessories: What “extras” are important to you? While not all hammocks come with special accessories, some do! If you “need” a carrying case, think a hammock pillow is important to you, or really want an accessories stand or pouch, you’ll find some fun options below! Knowing exactly what you want in a hammock will help you pick one that will completely suit your desires! Click the pics to see specific product reviews. Or, scroll down to see the product reviews of all of these Best Free Standing Hammocks of 2019 in order of recommendation. This Brazilian style hammock is our recommended free standing hammock for 2018. Why? There are a number of reasons. 1) Great Options: There are many options to personalize your hammock to your desires, including 3 different materials: 100% Brazilian Cotton (vegetable dyed, tight weave, soft and breathable), Polyester (fade-resistant, soft and durable, resists mildew and rot), or Sunbrella (weather-resistant, mildew and chemical resistant, stain-resistant, soft as cotton). All of these options have equally positive reviews. 2) Actual Customer Reviews. When people take the time to write in to sing the praises of this hammock… over 4,200 people, and the overall rating remains HIGH (4.7/5 stars is awesome), you know they’ve mastered free standing hammocks in this product. 3) Size of Frame: The frame is 9 feet long (4 feet across at the widest point of the stand) – taking up much less space than a traditional free standing hammock with the spreader bar style (12-15 feet required). 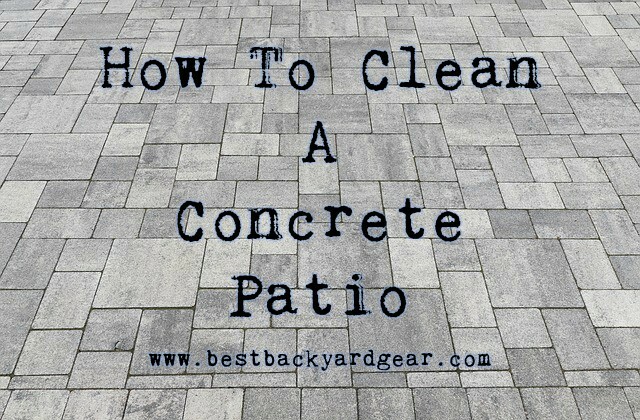 This makes it perfect for decks, balconies, or smaller patios. Yet, the smaller frame does not mean weaker or less stable – it’s completely sturdy per reviewers. The frame is made of heavy-duty steel with plastic caps on the tubing ends. 4) Assembly and Transport: This hammock is easy to assemble and dissemble, no tools required. The whole thing, hammock and frame together, weighs approx. 30lbs, and when in the travel bag, is roughly the size of a collapsible camping chair. 4) Warranty: The company offers a 12 month warranty on all materials and workmanship. If you prefer the spreader-bar style hammock to the Brazilian (see the Vivere above), this 2 person free standing hammock by Sorbus is our recommended product for you. Let’s take a look. This is a sturdy free standing hammock, with a very comfortable, wide hammock bed, a detaching hammock pillow for extra comfort, and 4 great color options. The bed material is made of a water-resistant (but not water-proof) quilted heavy duty cotton, with a UV-resistant dye so the colors won’t fade over time. It is attached to the spreader bar with sturdy ropes. This hammock stand has a larger footprint than the first we viewed but if you have the space, you’ll love it. Set up the stand (takes just MINUTES – the bars have easy snap button mechanisms), attach the hammock using the simple hooks, and climb on! You’ll want to be sure to unhook and bring in your hammock when it rains, as reviewers stay it’ll take a few days to dry completely if it gets soaked. This isn’t the most portable free standing hammock – it’s approx. 45lbs total, and does not come with a carrying bag. But if you aren’t looking for portable, this is a top quality, very highly reviewed option for your backyard, patio, or deck! Colors: Only as pictured here (“Sienna”). This 2 person hammock is also a great choice for your backyard relaxation. Frame: One of the things we like about this hammock is the frame quality. It’s serious stuff – made of heavy-duty 14-guage steel, and is coated with a weather-resistant powder-coating to protect against rust, and comes with plastic protective end caps. It’s not overly heavy (can be pulled across the grass to reposition fairly easily), but yet is completely sturdy. 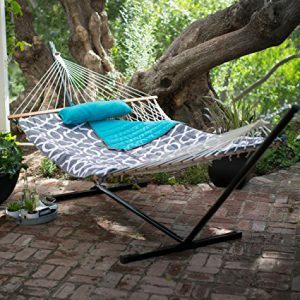 This hammock is also the only double hammock in our “Best Of” list that has a light colored frame. 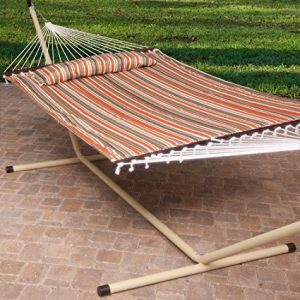 Size: At 13 feet long, and with a bed that is 54 x 77 inches this has a large footprint (remember, most spreader-bar hammocks require a longer frame to get the proper tension). Hammock: The material for both the bed and the accompanying detachable pillow is soft and quilted (not at all “slippery”, per reviewers), and is made of 100% cotton overlaying resin treated 100% polyester fiber batting. We’re pretty certain you’ll be more than happy with this 2 person hammock set up in your backyard paradise! But a tiny word of advice… hook the hammock in at least half way up or you’ll may find yourself lower to the ground than you’d like! Weight: Although this is considered a double hammock, it does have a lighter weight capacity than others – manufacturers list it at 275lbs, not the usual 450lbs. It’s also somewhat “skinnier” than others, with a hammock bed width of 36″ (length 72″). Reviewers say they had no trouble with 2 people on it, but it’s definitely something to keep in mind. The frame: As for the footprint it needs, be aware that it’s rather long at 12 feet 6 inches, which is normal for spreader-bar style hammocks. The frame is built of sturdy steel, and painted/ powder-coating for rust-resistance. The hammock: This 2 person free standing hammock is somewhat unique in that it has a removable hammock pad that rests on top of the white netting. We love that the “easy care” UV-resistant polyester quilted hammock pad and pillow are both reversible! You can select the teal or the grey pattern depending on your personal preference, and tie it to the netting so it doesn’t slide. Love it! Extras: Another unique feature of this luxury set is that it comes with a cup-holder and little pouch for your phone or tablet. Imagine how challenging it will be to get ANYTHING done with this in your backyard! The Hammock: Reviewers say that the fabric is like a soft, dense canvas, yet somewhat stretchy (technically, it’s “acrylic coated/weather resistant cotton”). 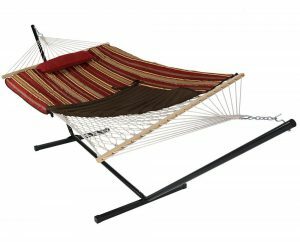 It’s a very large hammock compared to some of the others, measuring 60″ wide, and 86″ long. And, it comes with 3 color options, so you can select what you like best. The Sorbus 2 Person Brazilian style hammock is a solid buy – especially for the fantastic price! 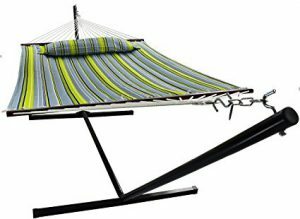 This is another Brazilian style hammock that offers a great product for a surprisingly low price! 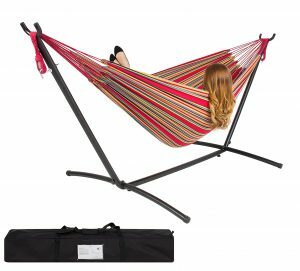 It’s designed to be portable (comes with a sturdy carrying case, and is only just over 30lbs when packed up), so if you’re looking for a free standing hammock that you can take with you camping, to the cottage, or any other destination, this a great choice! The SueSport double hammock frame design is space efficient, as are many of the Brazilian style hammocks. 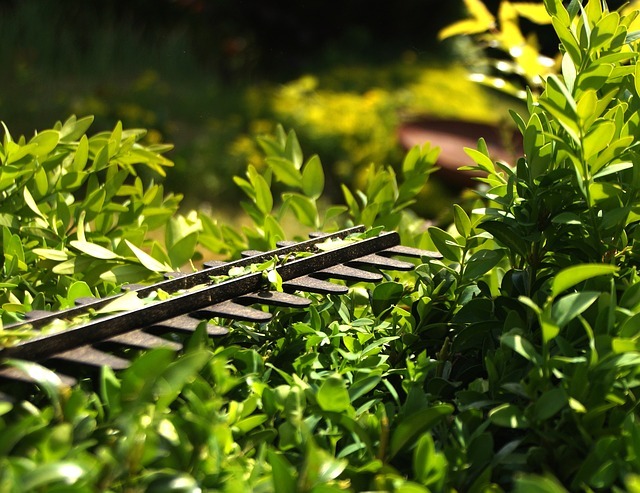 The stand is made of weather-resin steel, powder-coated, and rust-resistant. It’s footprint is just over 9 feet x 4 feet – which is definitely smaller than the spreader-bar hammocks which often hit the 12-15 feet mark – and it can be assembled “in 5 minutes, with no tools” (paraphrased from several reviewers at Amazon). The hammock itself is made of 35% cotton, 65% polyester. According to reviewers, it’s a thick weave, yet soft and breathable, but can get a bit warm if you’re sunbathing on it in direct sunlight. 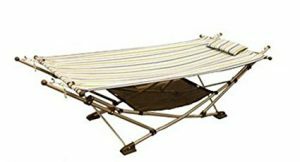 This “4 point hammock” is a deluxe double hammock that is a bit different from the spreader-bar OR Brazilian style hammocks. It’s more of a hammock bed. It will look great and be the perfect place to stretch out in the shade (or sun if that’s your thing) in your backyard oasis! 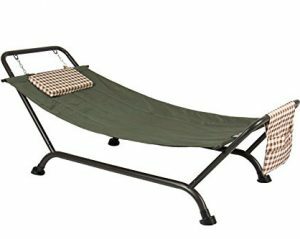 This hammock comes with the detachable pillow and accessories bag so you can easily store your books, electronics, snacks, or whatever else you need for a relaxing afternoon outside. The material is a soft polyester, has a “quilted” feel to it, and you’d be advised not to let it get too wet in a rain storm or it’ll take a few days to fully dry (most people remove it from the frame and bring it inside when it looks like rain to best preserve it). 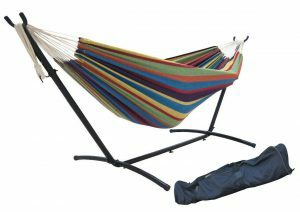 One of the negative aspects of this unique hammock bed is that you can’t find a replacement hammock very easily at all if for some reason you want one. 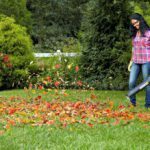 Although the material is very durable and should last for years, if your dog happens to rip it up, you may have to replace the whole thing at this point. It’s a relatively new design, so hopefully manufacturers are coming up with something soon! 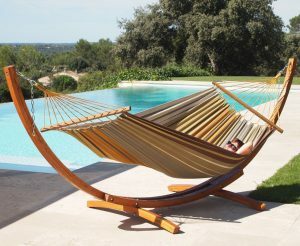 This wooden frame hammock by LazyDaze Hammocks certainly has that “wow-factor” if that’s what you’re looking for! Imagine how great it would look beside your pool! The Frame: This is the only wooden framed free standing hammock that made our “best of” list. It’s made of Russian pine, coated with varnish. Some reviewers went ahead and coated it again with one or two coats of spar urethane to protect it even better from the elements, but you don’t have to – it comes fully coated already. This hammock frame is about twice as heavy as many of the steel frames – with hammock it’s over 60lbs. Hammock Materials: This LazyDaze wooden hammock offers two options for hammock materials: 100% cotton (thick weave, almost a canvas feel), or Sunbrella. The Sunbrella is a more expensive material than the cotton but more durable and water-resistant/mildew-resistant than the Cotton option. The Sunbrella option comes with a matching detachable hammock pillow for your added comfort. Overall: For looks, this one is our personal favorite. Unfortunately, there are 2 strikes against it – your circumstances will be the judge of if they are important or not: 1) The maximum weight capacity being only 275lbs means that two average weight adults won’t be able to enjoy this hammock together. 2) The fact that it’s so heavy and needs to be bolted together to set up (not using snap-together mechanisms like the steel frames) means it’s not portable for those who like to bring it along to a new location on occasion. Some things to consider. The frame is made of coated steel, and is designed to be assembled in less than 10 minutes, without the use of any tools – other than your strength… several reviewers say it was hard to initially stretch the hammock from end to end! The frame is large – 12 feet long! This is another free standing hammock that has a weight capacity of “only” 275lbs, so again, heads up if you’re looking for a hammock that two adults of “regular weight” can enjoy together. 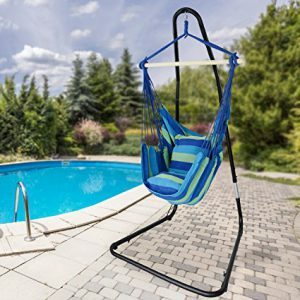 This free standing Brazilian style hammock by Best Choice Products is a great choice if you’re looking to spend the minimum required to still get a great portable hammock. The hammock: The material for the hammock is a strong but soft 100% cotton. It’s washable, but you’d be advised not to dry it in a machine, but rather hang to dry (no shrinking that way). The size is actually “double wide” – probably the widest of all of the hammocks featured here at 57″ across. 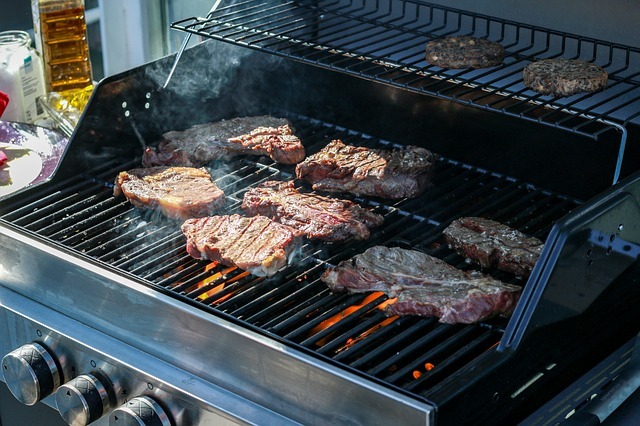 Great for 2 people! The frame: Like the others, it’s made of powder-coated steel. It’s just under 12 feet long and 4 feet wide. 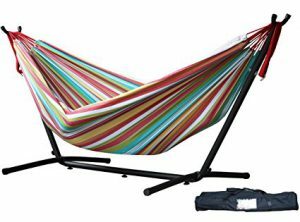 Some of the color options for this hammock have an accessory tray attached for your use – it features 2 cup holders, a phone holder, and a slot for magazines, books, or a tablet. Can you imagine just how easy it would be to vanish an afternoon or two or three swaying away in this hammock? A hanging free standing hammock chair would be a wonderful addition to a back patio or lake side dock, don’t you think? This particular one is the top rated product we’ve found. You can both sit up and recline in this woven chair made of 1/8″ thick soft-spun polyester rope. The spreader bar ensures that your weight will balance in the middle of the seat, which comes in at approx. 30 – 40 inch wide. If you’re wanting something with a tad more structure, you can add a high backed patio chair cushion – it will easily fit and give you more “form”. Most people however, love the lazy feel of the rope hammock chair. A quick heads up to parents: If you’re considering getting this hammock chair for your children’s use, note that although it looks like a swing, it is not meant to be one. It’s very stable on a flat surface and will sway with proper use, but swinging will compromise the stability. This metal stand and hammock chair set is a great option if you’re looking for a stylish hammock that has an accompanying pad in the chair. The seat is easily large enough for adults, approx. size 17″ x 17″. The cushion seat padding is not rigid, but does provide some back support and structure (the sides don’t fold fully in on you). The seat is made of a sturdy cotton and polyester blend, and can be slipped off the wooden bar and machine washed. The frame is made of powder-coated steel, and can be very easily raised or lowered to suit your needs. This type of hammock chair is known as a hanging chaise lounge chair. It works the same way as the two hammock chairs above, dangling from one point, but has much more structure in the seat. 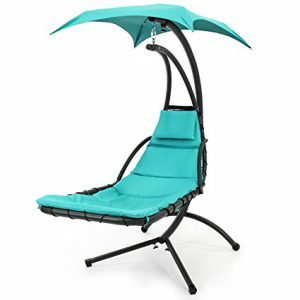 We love the unique, modern shape of this hammock chair, and reviewers say it’s extremely relaxing! The umbrella is removable if you’re in the mood for some sun, and you can adjust it to whatever angle you want if the sun is moving across the sky. The seat is made of 2-inch-thick foam-filled PVC-coated polyester cushion (as is the built-in pillow) – tough but comfortable. 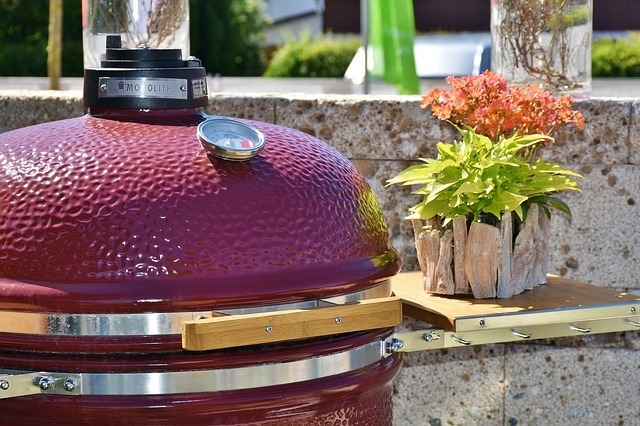 The frame is built of heavy-duty powder-coated steel, is weather-resistant and very sturdy. You’d love sitting in this relaxing hammock chair while grilling on your gas grill or wood pellet grill too! This is a portable hammock, comfortable and fairly low to the ground. It’s super easy to set up and take down with it’s lightweight, collapsible stand. A unique feature of this camping hammock bed is that it has chains to secure against excessive swinging if you’re planning to use for sleep overnight. It actually can not swing 360 degrees, but it is not stationary – it swings and sways like a regular hammock. It packs up into it’s carrying bag very easily, according to reviewers. Size is approximately 9.5 x 10 x 50″ folded down. Apparently it is not as light as you’d like it for backpacking purposes though – several reviewers who said it was very comfortable and easy to assemble also said it was heavier than they’d hoped. You’ll love this folding hammock if you’re looking for something easy to assemble and ready to enjoy. It comes with a pillow attached by Velcro, and has a handy mesh cradle underneath that can hold your sunglasses, books, or electronic devices while you nap. This hammock bed does not move much – no typical hammock swaying. The frame is very sturdy, made of powder-coated steel, painted with high gloss. This hammock is not made for very tall adults, as it’s length is just over 6 feet long. The style is a combination of spreader bar and 4-point: the hanging bed attaches to four corners by four chains. You’ll find it a comfortable place for a lazy afternoon or relaxing overnight! Enjoy Your Own Free Standing Hammock This Year! And there you have it… 15 of the best free standing hammocks in 2019 that will help you thoroughly relax! If you choose based on your personal desires, you’ll no doubt be happy with any of these options. Having a hammock is a lovely luxury, much like having an inflatable hot tub to relax in, or a fabulous patio heater to make your backyard a place you really want to be. Why consider a hammock in particular though? 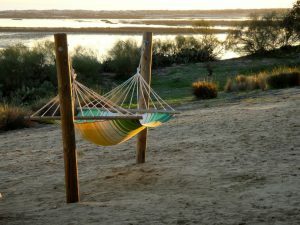 There’s nothing like nestling in your cozy cocoon or on your flat spreader bar hammock bed and listing to the sound of birds chirping, water lapping on the shore, wind in the trees, and more. It’s delightful to sway softly into a gentle sleep, read in complete peace and relaxation. Many people would just love to own a hammock, but assume they can’t if they don’t have two perfectly situated trees to hang them on. If that’s your situation, now you know you CAN have the hammock life, and thoroughly enjoy it with one of these fantastic free standing hammocks! Feel free to contact us with any questions or comments – we’d love to hear from you! Did you know? If you have a Brazilian style double hammock and are worried about being too cocooned if you’re lying solo, you can simply fold over the edges or even fold the hammock in half lengthwise before climbing on! This minimizes the cocoon effect. Did you know? The correct way to lay on a hammock is at a diagonal. 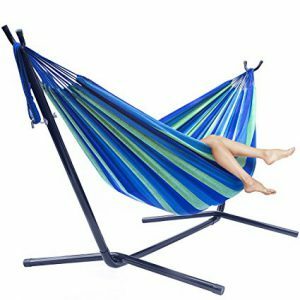 This ensures you are comfortable and flat, instead of squeezed into a curve and swallowed up by the sides of the hammock. Hammock hanging tips: 1) Hang it with a good sag in the middle. You’ll be more comfortable than if you stretch it taught and climb on. 2) Hang your foot end higher than your head end. 3) Add a sleeping pad or bag underneath you for WARMTH if you want to sleep out in your hammock – the hammock material isn’t insulated. 4) Hang your hammock no more than 3 feet off the ground if you’re spending the night… a 3 foot drop is livable, if you should move around in your sleep. A 6 foot drop might be rather dangerous. Never realized there were so many different types of hammocks! Great pictures and explanations of all varieties. Didn’t realize they come in different fabrics and styles – love the cotton, myself. Really view hammocks differently now. Truly everyone should get one as they would add so much comfort and would be a great asset to your patio or backyard. Thanks for commenting, Andrea! Do you have a favorite here? I honestly never knew there were so many different types of hammocks. This is truly the place to be if you are in the market for one, and why wouldn’t you be they look incredibly comfortable no matter which one you choose. This definitely gave me a lot of insight on the many different types of hammocks and which one would work best for my lifestyle. Great read and great pictures really learned a lot! after looking over your site ( I admit I didn’t read everything ) whats the easier hammock to get in and out of, you see a lot of people falling out of them on YOUTUBE, and the last thing a person needs is to be hospitalised buy one of these. so which is better spreader bar or Brazilian style? Your comment made me laugh… I know the videos you’re talking about! 🙂 While they do look rather comical, I always feel a bit sorry for those who end up unexpectedly on the ground. As to what’s easier to get in and out of, the spreader bar style or the Brazilian style hammock, honestly it’s totally a matter of preference. Some people prefer the tension of and feel safer on a hammock that’s spread wide (spreader style). They feel like they have more control as they can spread out their weight to balance! Others just feel safer enveloped in the hammock material (Brazilian style) – as if all that material around them will catch them if they tip. Truth be told, hammocks are not really meant for those who know they will do some serious damage to themselves if they have an even slightly awkward fall (I’m thinking of my elderly grandfather – he should NOT be attempting to use a hammock, in my opinion). Safety first is pretty key. Great question! Sorry I don’t have a more definite answer! I appreciate the comment! Have a great day! Thanks for the great review Marlaine. I already have a Brazilian hammock. It was a Christmas present from my brother-in-law. I have used it a few times but not nearly as much as I like. Before reading this post I didn’t know that there were different kinds. The spreader style looks really nice and I think I’d love that. Looking at it I would’ve thought it would tilt, but it makes sense that it doesn’t because if it’s tight then it’d be right! Will have to look through again and see which one I’d like to buy. Hi Owain, thanks for dropping in! 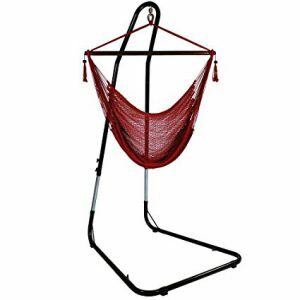 I personally have a spreader style hammock, which I bought initially because it looked like you could have 2 people on it fairly comfortably. It did end up being exactly what I was looking for, and we enjoyed it tremendously until we had to cut down the 2 trees from which it hung (diseased trees… so sad). I really missed it – thus the idea of looking at free standing hammocks! The spreader bar style can tilt if you are a bit wild on it, but overall, I didn’t find it bad at all! I haven’t tried the Brazilian hammock with 2 people myself… but I have napped in one by myself while on holiday and it’s so wonderful how you feel shut away from the world inside it! I’ve been thinking about getting a hammock lately. Thanks for the info. This helped me out. You’re welcome, Kayla! Thanks for dropping by!